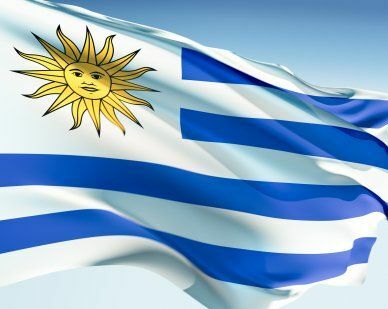 In 1828 the flag of Uruguay had 17 stripes of blue and white. In 1830 the stripes were reduced to nine. The flag has a white square in the left corner with a yellow sun called the sun of May. The sun has 32 rays, 16 straight and 16 wavy. This sun represents the Inca sun god Inti. It is called May to commemorate the May revolution of 1810. The sun has come to represent independence and freedom. Our top-quality Uruguay flags conform to all official specifications. Emblems and designs are executed with the highest possible degree of accuracy in regard to detail, color shades, placement and proportion to flag size.